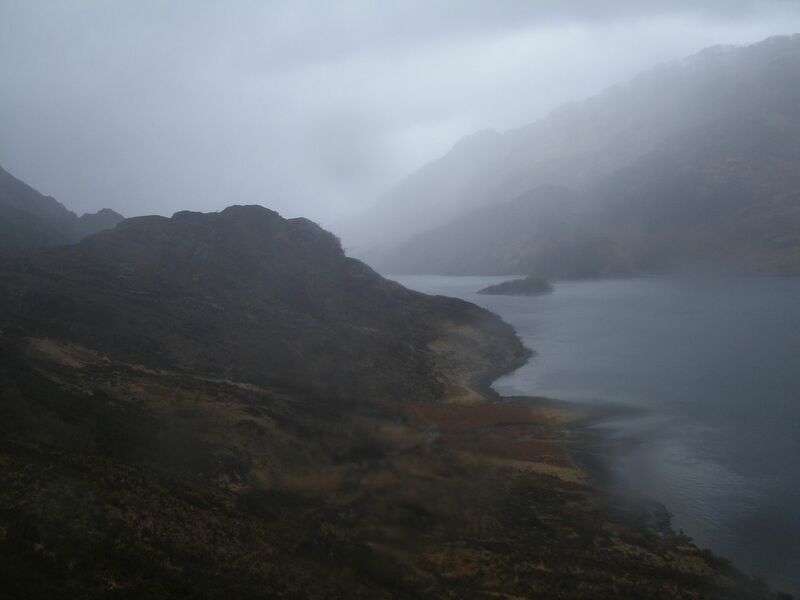 So back in January, it seemed like such a sensible thing to do – Take a week off in May to go to Knoydart - bound to get some bonny weather we thought.. 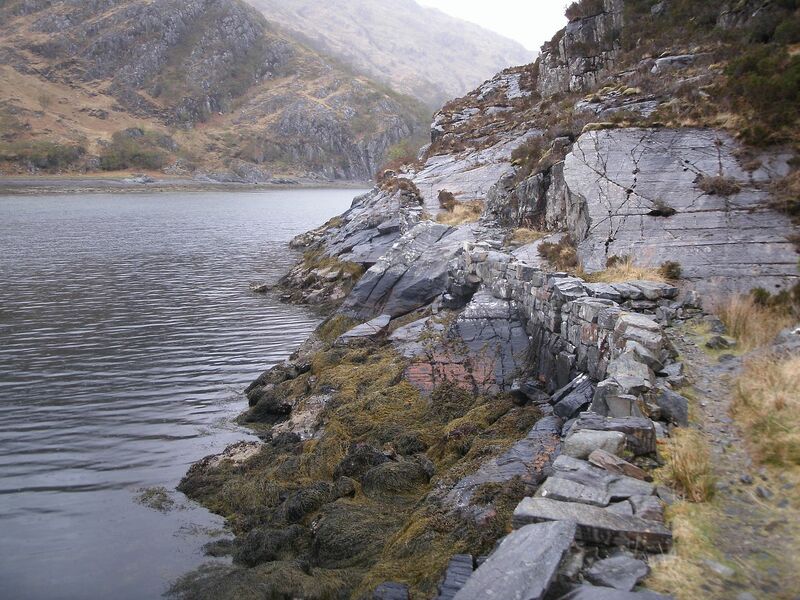 The rain eased slightly, so we set off along the old path that clings to the rocky coastline toward Barrisdale. The going was easy, despite a rather wet thicket of rhodedendrons taking their toll. Waterproof troos were on before long as the rain got heavier and heavier. There was still high spirits and optimism in the air though, and despite the clag, there was the air of being in a beautiful place..
Up and down the rises and dips in the path we went, fresh views at every turn. By the time we hit the track going into Barrisdale though, we were soaked right through to the skin. We were glad to get to the Bothy, where it was fairly busy. There was a couple of kayakers, a canadian couple, and a big group of walkers that had managed to get a boat from Arnisdale. We hung up our wet gear, but there was no fire, so just a small amount of dripping rather than any hope of it actually drying. 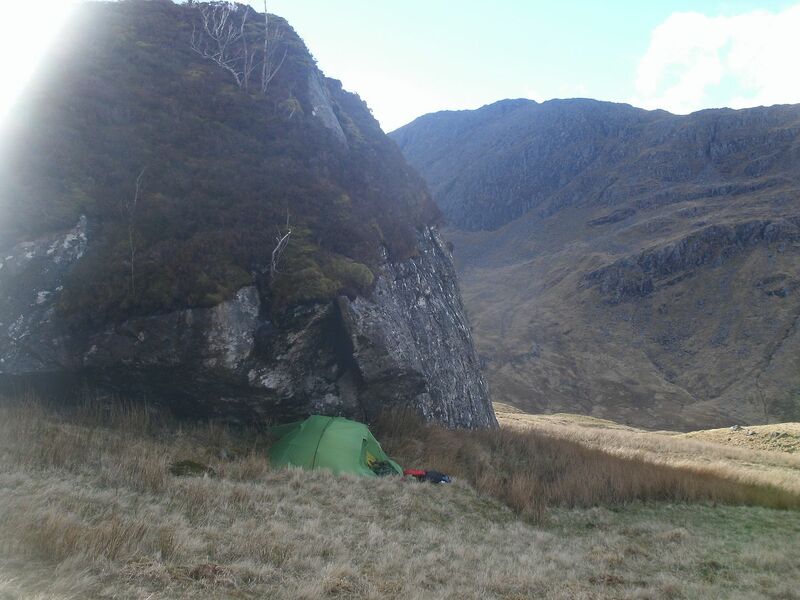 The bothy was full, so we thought about pitching the tent, but one of the Kayak guys had a tent up that was hit by a gust of wind and destroyed just when we arrived, so we decided better to keep the tent intact and sleep on the floor. Oh the mice were active at night! Still got a good sleep though.. Morning came, and the rain was off! 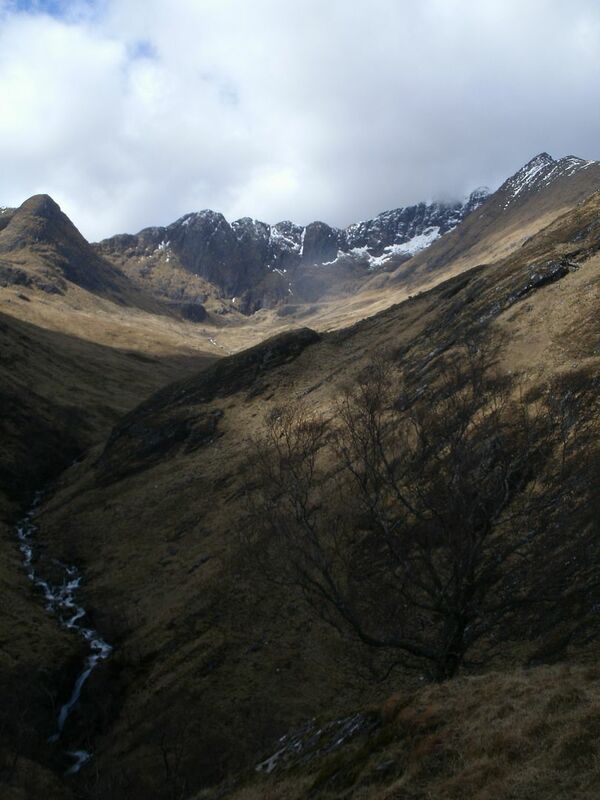 Ladhar Bheinn a go-go! Sleeping in the kitchen/common room meant we were up early, we teamed up with Mark and Shireen from the other group and set off. The wet gear was dry in no time in the stiff breeze and sunshine. We made our way up an old path that zig-zagged its way up over a shoulder. 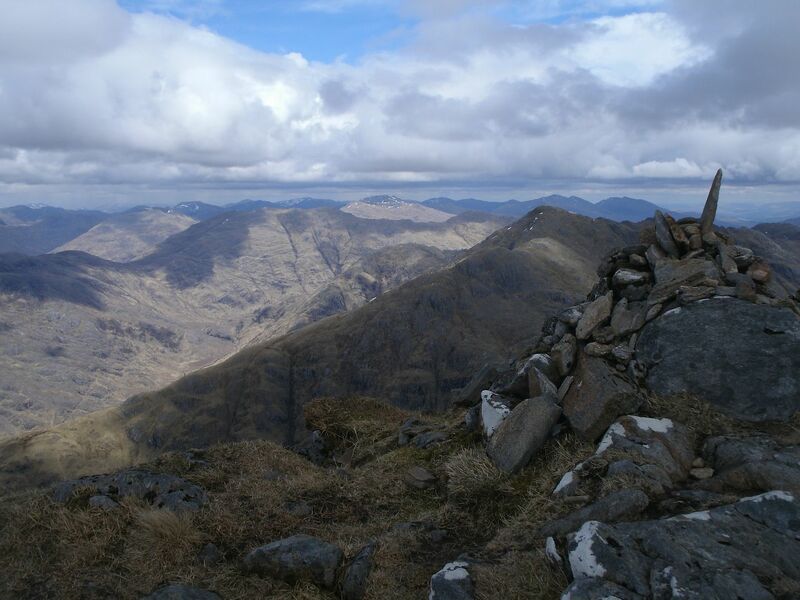 Views over to the Kintail hills and Arnisdale were stunning. 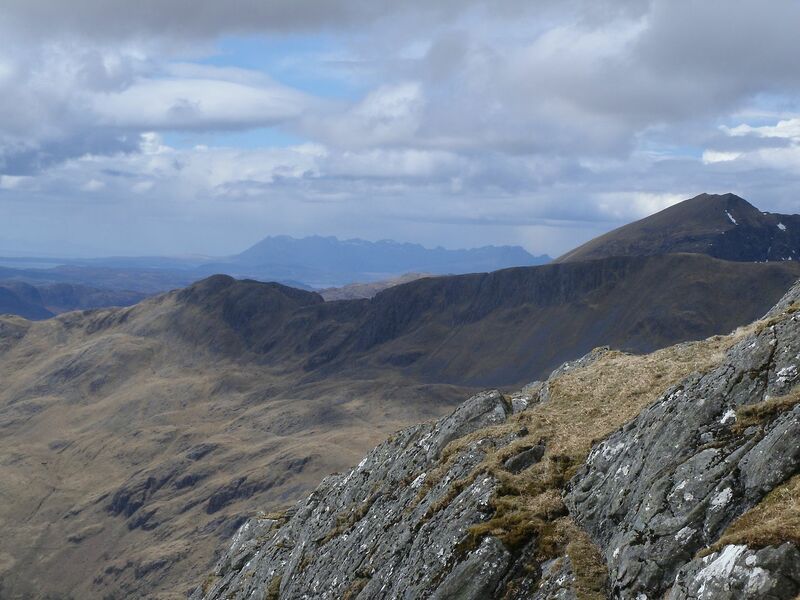 Once over the shoulder, the path took us up toward the main corrie – we could see the summit was almost clear, and the anticipation of climbing such a stunner was palpable in the air. 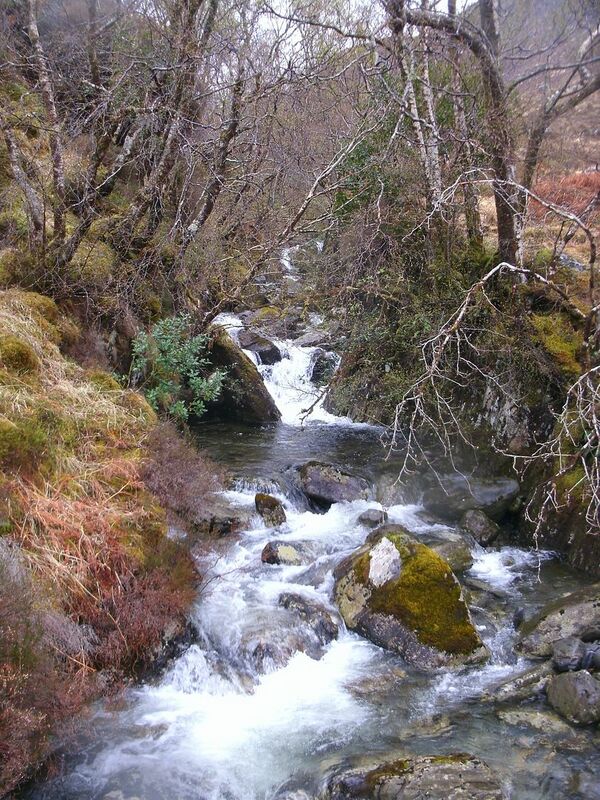 A bit further up, we managed to get across the river and started our ascent up onto the ridge. A hard slog, but I think we chose a good route. 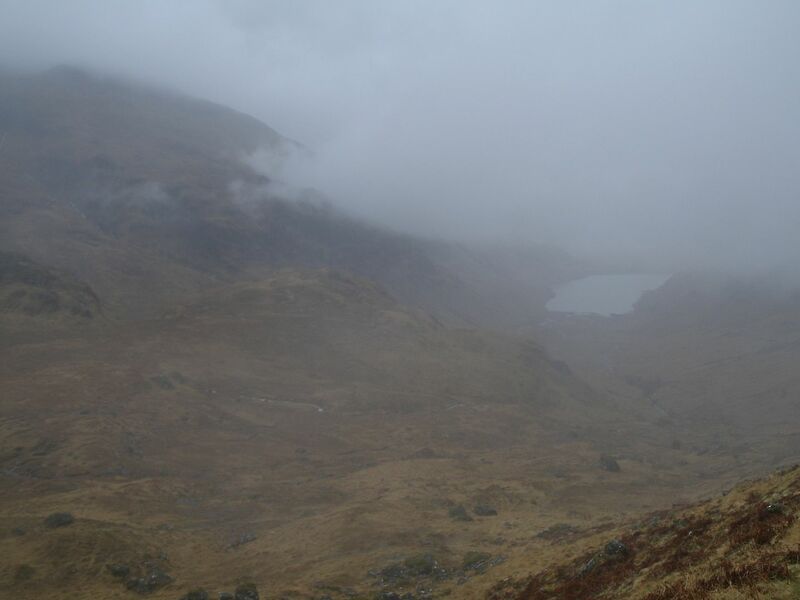 Unfortunately on the climb, the clag came over and at 800m, we hit it and had to put all our jackets back on as it got cold and damp. Once on the ridge though, the walk was a delight.. There was a fair bit of snow about which was soft and slippery, especially on the steeper sections. The ridge was very narrow with a cornice heaped on one side, which made the ridge seem even pointier. The slopes disappearing downward into he clag either side were awful steep, and every time I looked down the vertigo was unbearable, so I tried not to look. 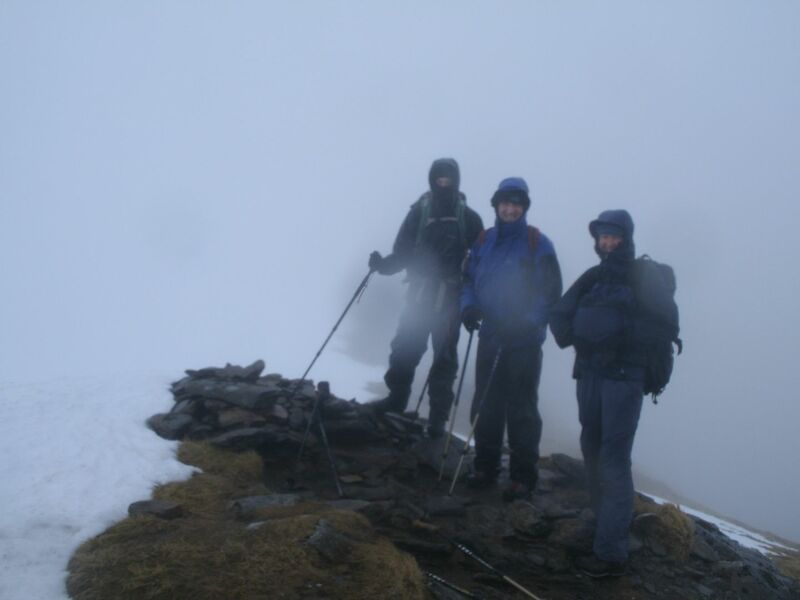 About 200 yards from the main ridge, it started raining, and when we finally got up to the there, we found we were blasted by high winds and snow.. Just a couple of hundred yards run out to the main top.. Don’t these 3 look like they are having fun at the Summit! 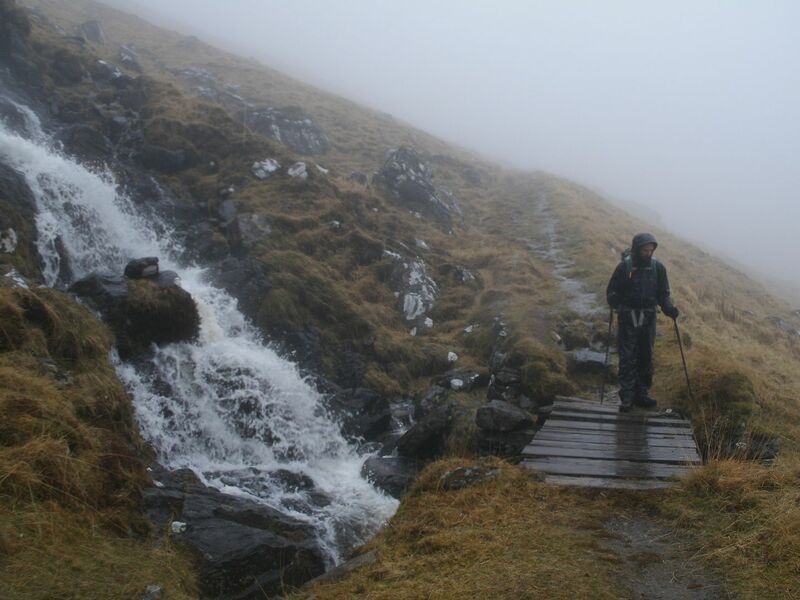 We all had wanted to go along the main ridge to Mam Barrisdale and return to the bothy that well, but the weather made that unfeasable.. So nothing to do but a hasty retreat the way we had come, the sleet and rain increasing in intensity all the time. Our hasty retreat possibly made me a little careless as I had an uncontrolled slip a good bit down a snow patch.. blooming terrifying for those few seconds I can assure you! 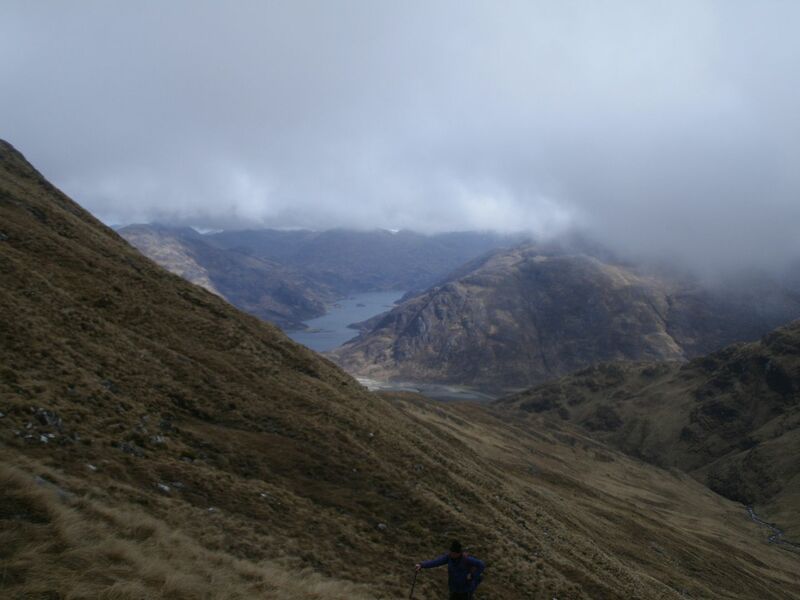 We followed the ridge path a bit further along from where we had come up, but it soon fizzled out and we were left to cross a boggy quagmire down to the river crossing. I was soaked through and was the coldest I have ever been on the hill.. The wind was biting through my (supposed) waterproofs, and I was a little worried by it all. The river had risen quite a bit since we were last there, which made for an interesting crossing. Don’t know why I didn’t just wade because I was as wet as could be anyways! The incline of the path going back over the shoulder warmed me up rather, but there was no let up of the dismal rain. We returned back to the cold bothy and I tried to keep the flow of tea and food going in a vague attempt to keep warm for the second night running. Everyone was more subdued, the cold and damp sapping all energy. Another night on the floor – the mice must of got a good meal next door because they weren’t out in the bothy. 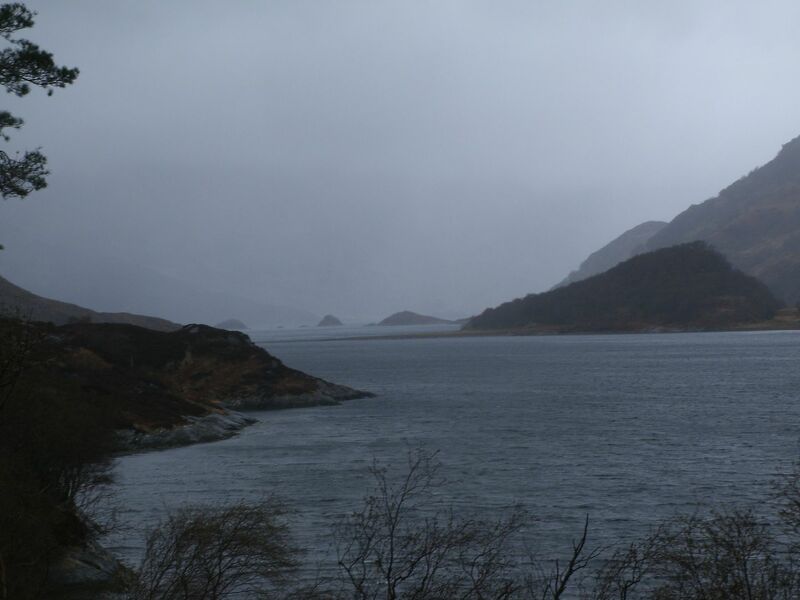 The morning came and it was still raining.. We had a bunk booked in Inverie though, so we had warm showers and drying rooms and a pub to look forward to. We waited until lunchtime to leave, vaguely hoping that the rain might stop. Hopes dashed, we set out in drizzle in our still sodden waterproofs, up to Mam Barrisdale. It was a bit of a slog, our kit got heavier as the rain worsened. We hit the bealach to find a fierce wind in our faces. 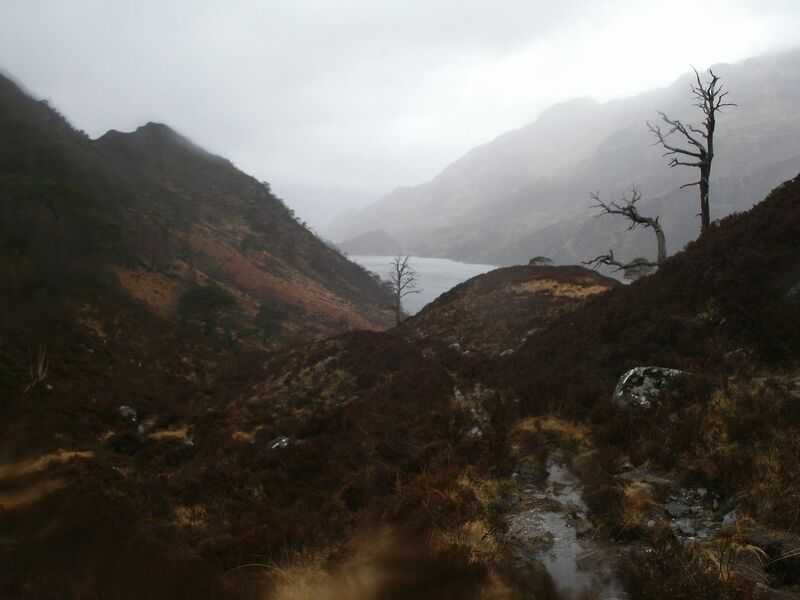 The walk down the other side to Inverie was a real low point in the trip. Both of us were tired and cold and were wondering what the hell we were doing there, but at that point the warmth in Inverie was closer than any other so nothing for it to plod on. The following morning we awoke to find a beautiful day, but with our kit still not dried out properly we decided to take the day off . We spent time at the café, lobstered ourselves on the beach and once again overindulged at the pub. Too hot for the hills anyway in my opinion. There was a weird incident at the bunkhouse that night when we were in the common room and an elderly dutch guy comes in, strips off down to his skid-marked y-fronts and starts doing his yoga.. It was pretty horrifying, and totally spoiled our die hard with a vengeance! Wednesday came and it was still nice. The 'incident' the night before was more than enough to convince us that it was time to leave Inverie. Time to take on the other two then. We were a bit delayed for a start because we needed the shop and it didn’t open until 9.30. We turned up at 9.30 and it wasn’t open, but after a tea at the café it was, and we got a few things. This trip was taking longer than we had anticipated. 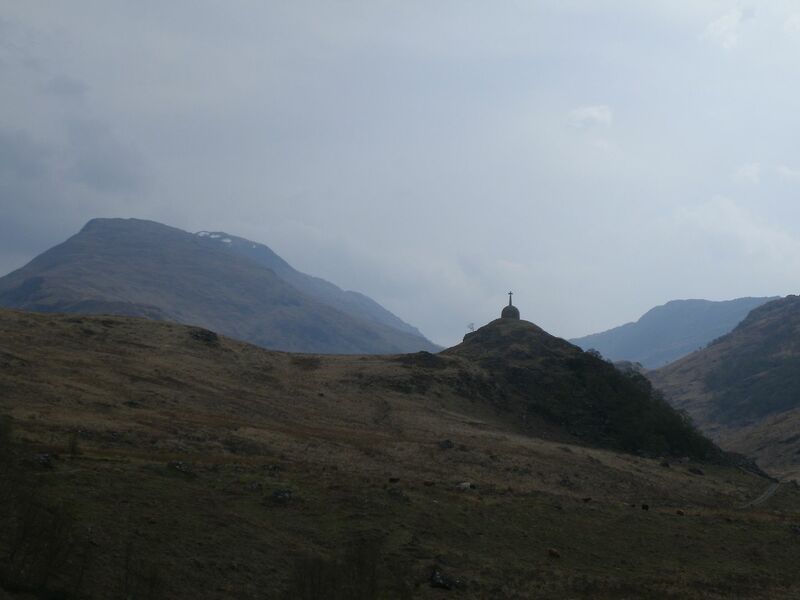 So we finally said farewell to Inverie and set out up past the monument, taking the right fork in the track. We crossed at the first bridge we came to – probably a bad plan, but I had fun hopping across the bog, even if Dougie didn’t. Bonny river though, and we were soon looking for the path up the hill. We didn’t really find much, and were forced round the hillside a way before we found our way up. The initial ascent through the crags was steep and tough with our heavy packs, but before long we were up on the ridge and it was easy walking underfoot. The wind was slightly problematic though, and as we got higher, it inevitably got worse and it was harder to mobilise. It had started raining as well - light at first, but increasing all the time. There was a descent then re-ascent up a narrower, rockier ridge that would have been fun in better conditions before the last pull to the summit. The last few yards were extremely difficult in the wind, and I was somewhat disappointed as the rest of the ridge was just unfeasable today. We could see the weather that was coming and it didn’t look nice! So in a blind panic, for the second time this trip, we were forced back the way we had come by the weather. We retraced our steps down the narrow bit and to the coll. We headed from there directly down the hillside, which turned out to be ankle crunchingly steep and slippery. By now we were used to the feel of increasing rain on our backs so we hardly noticed. 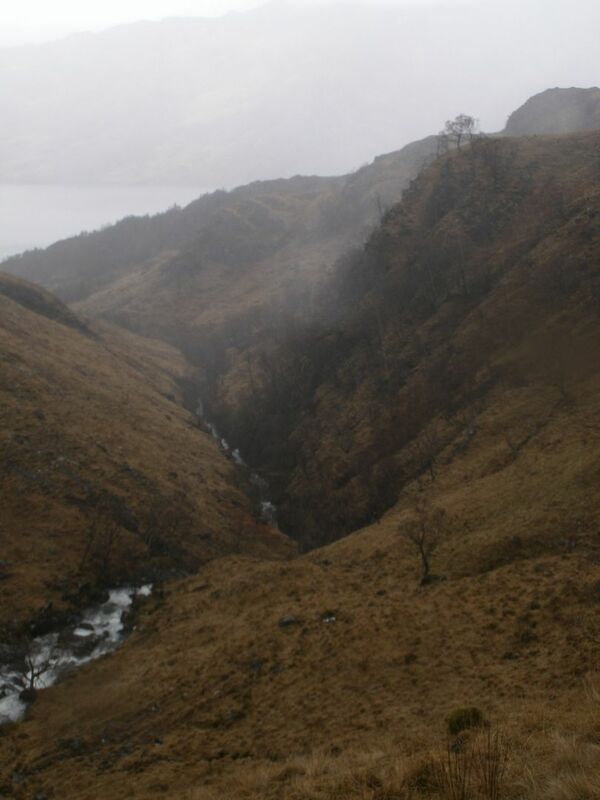 Some of the hillside had been victim to a recent landslide which made the descent even trickier! but all eyes were drawn to a massive boulder on the valley floor. It really was quite a landmark. Both Dougie and I were thinking the same thought – that a boulder of that size might offer enough respite from the high winds to actually pitch the tent and get some shelter. We got there to find it was better than we ever had hoped, with a fine pitch and a spring bubbling out of the hillside just a couple of yards away. Also a foxes den under the boulder but we didn’t see or hear them – probably scared them too much for them to come out. Despite the forced retreat we were in fine spirits, and a good dinner helped make a fun evening. We would just have to try again tomorrow. 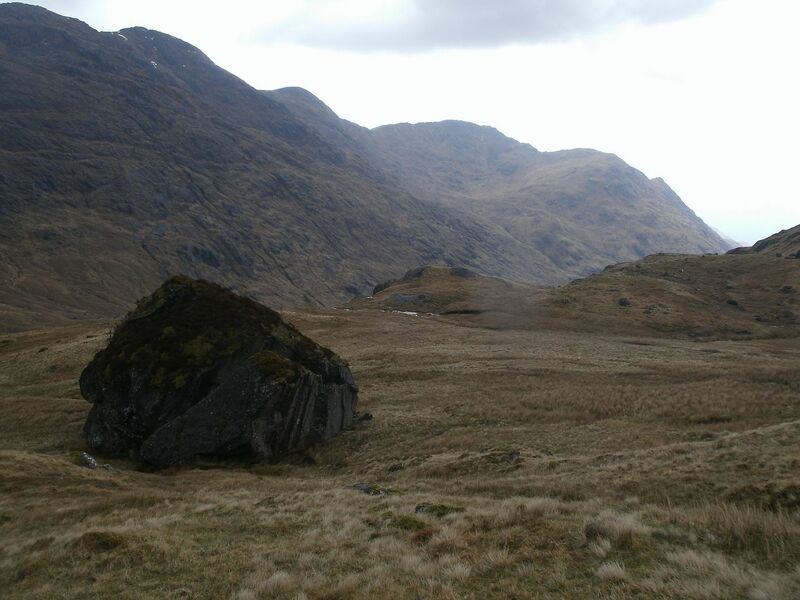 So far it had taken us 5 days to bag 2 hills.. Not exactly a flying trip to Knoydart! Thursday came, and again it was sunny! 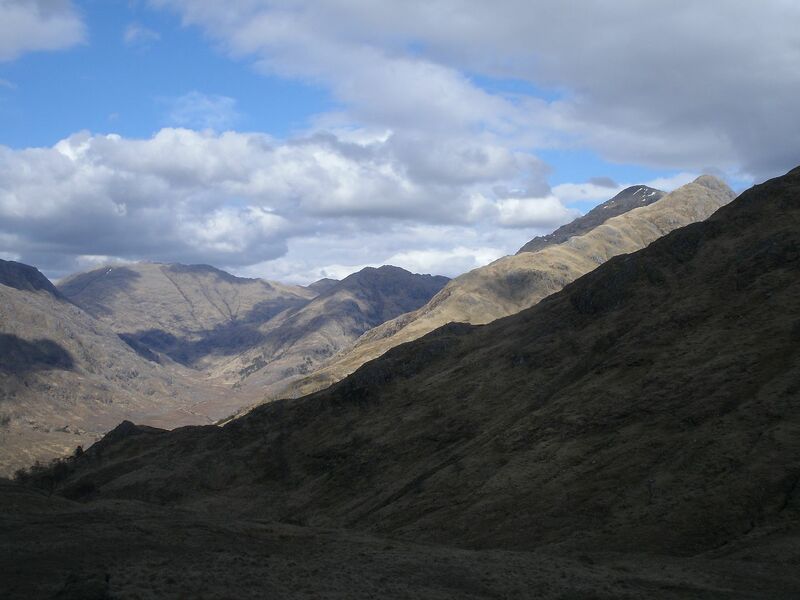 I don’t know why we didn’t just do the slog back up to the ridge - no thought was put into the route at all.. We just headed down Glen Meadhail and through the pass. We stopped at the private bothy – it’s a lovely spot even nicer on such a bonny morning, then continued back to the path up to Mam Barrisdale. 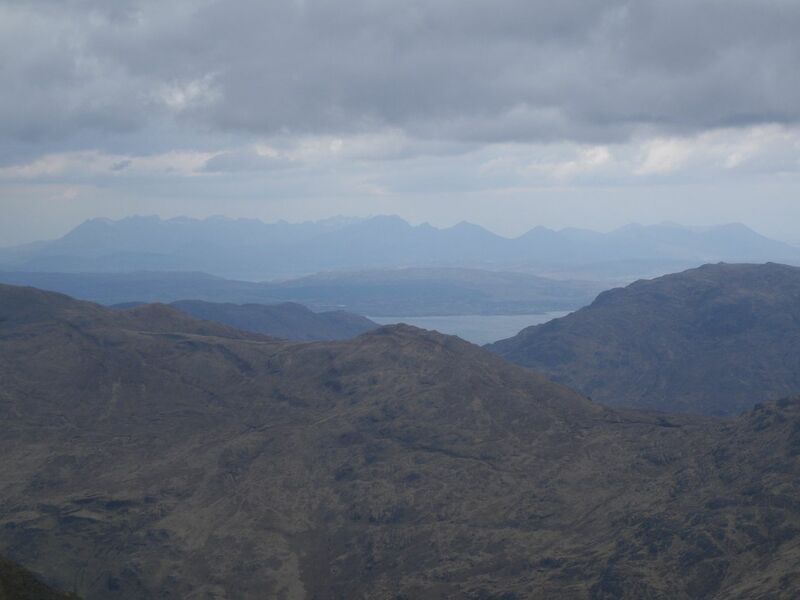 It was a hot walk and difficult to get any pace up, but we still managed to get to the bealach before lunchtime. 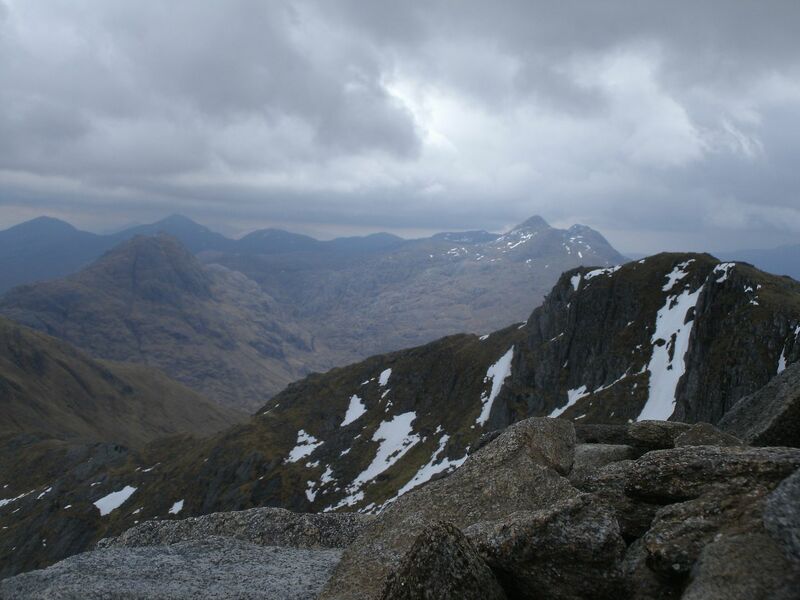 Now to take on Luinne Bheinn. We dumped our big packs and set off, only to find we had forgotten water, so we had to go back.. We set off again 20 minutes later. 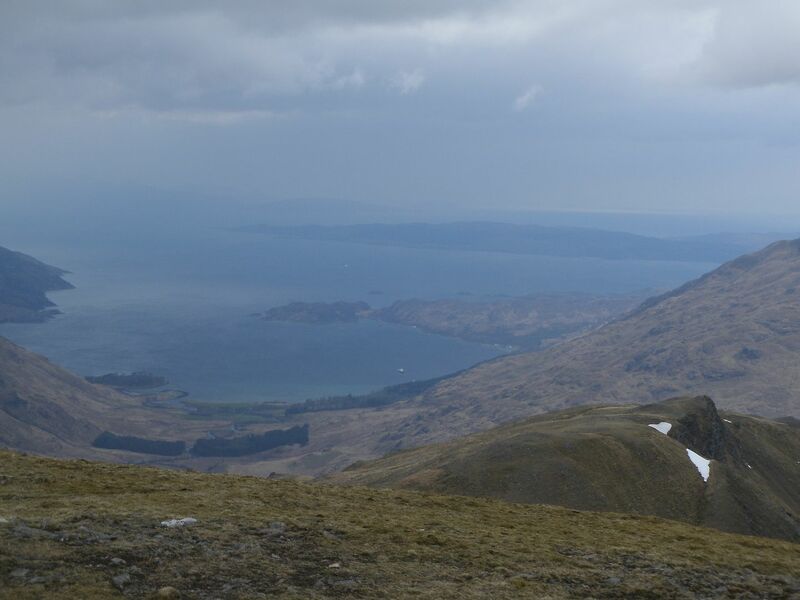 The path from the bealach is boggy, eroded and nae much fun tbh, even with the stunning views. It follows a line of fence posts, but after we had been on it a while, it seemed like we were passing by the summit rather than climbing up to it we saw a large gulley that would take us through the crags and it was too good an opportunity to miss. A slow sweatfest followed, but we gained height quickly. We had soon found a wee path that took us up to the summit. 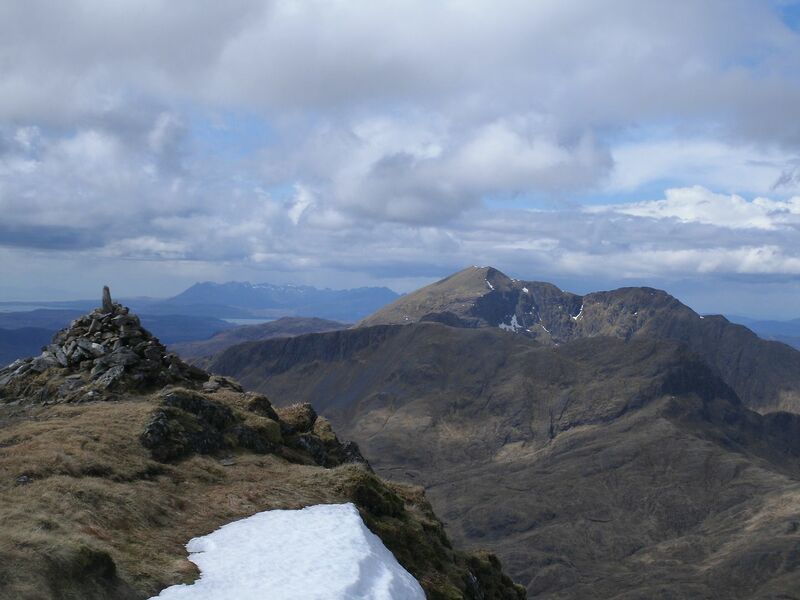 Wasn’t the right summit, but the real one was just a wee wander away. It was stunning up there, windy, but stunning. This is what we had envisaged when we planned the trip, it was just amazing. We left the summit, intending to take the ridge path down. We could see it from above and it looked fun. We managed to find a sheltered spot out of the wind and spent a long time lying in the sun taking in the views and munching haribo. The path down did not disappoint, it was steep and wound its way through the crags in a very pleasing manner. 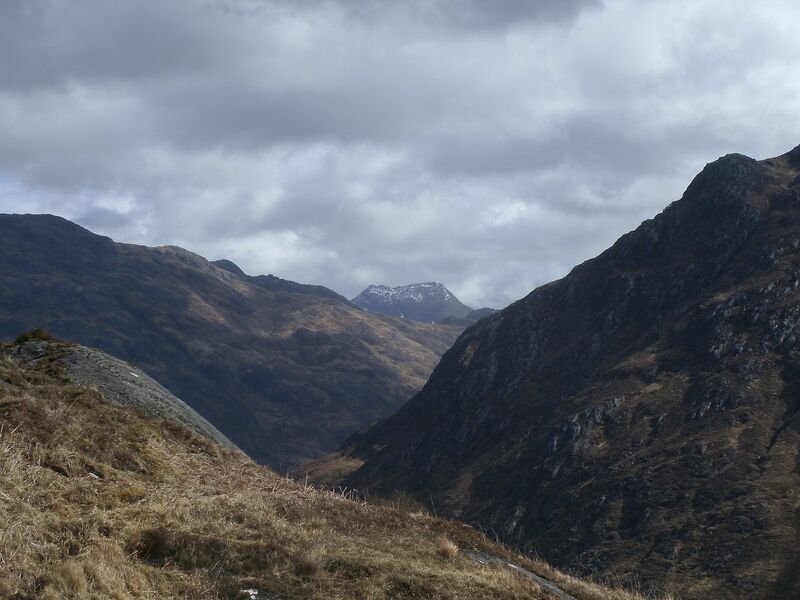 We were windblasted but happy all the way down, Ladhar Bheinn looming ahead of us the whole way commanding our attentions. I was disappointed when the path fizzled out and I realised we were just a couple of hundred yards from the bealach again. It had been a long day though, and aching feet told me it was time to make camp soon. 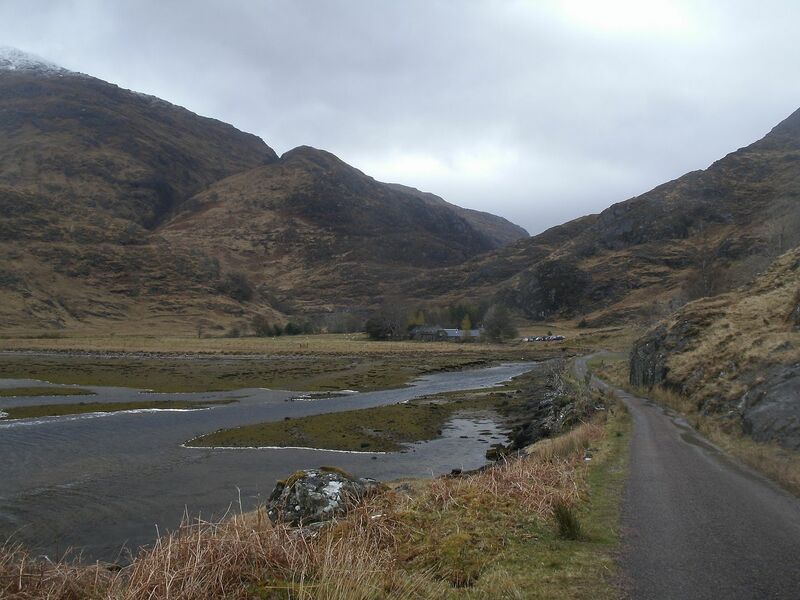 We retrieved our big packs, and set off toward Barrisdale. 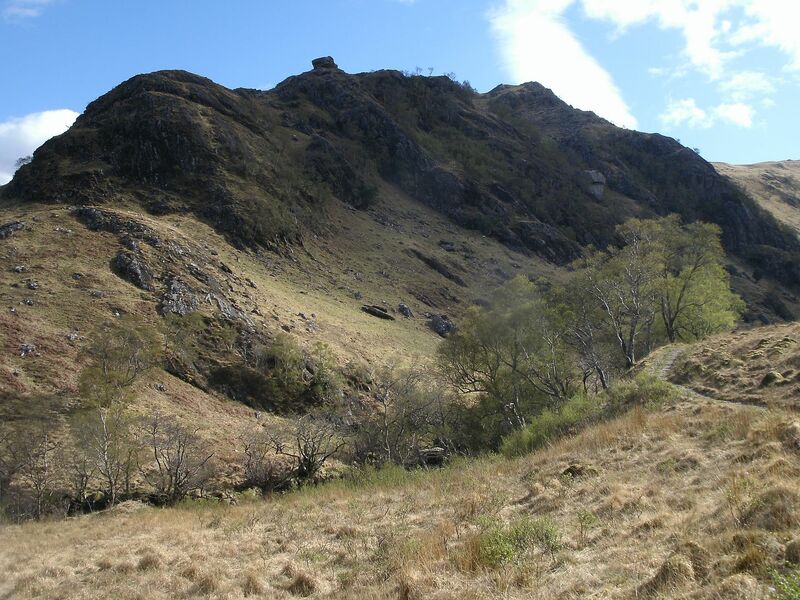 A couple of spots for camping were checked out before we found the one – on a knoll on the slopes of Ladhar Bheinn, high up above Barrisdale. It was still hot and sunny so the tent dried out from the previous nights rain quickly. It was an amazing spot with cracking views. I soon found out that the pitch had drawbacks, when I looked down whilst making a cup of tea to find literally an army of ticks advancing toward me over my sleeping bag, they were everywhere! We managed to evict most of them, and set up defences but in the morning our departure was delayed somewhat by the need to spend an hour or more picking ticks off each other..
Friday morning was nice though – fine and sunny – so when we finally got going, I was rather regretful that we would be walking out today. We wandered down to barrisdale bothy in the sunshine, and called in to retrieve a hat Dougie had left. 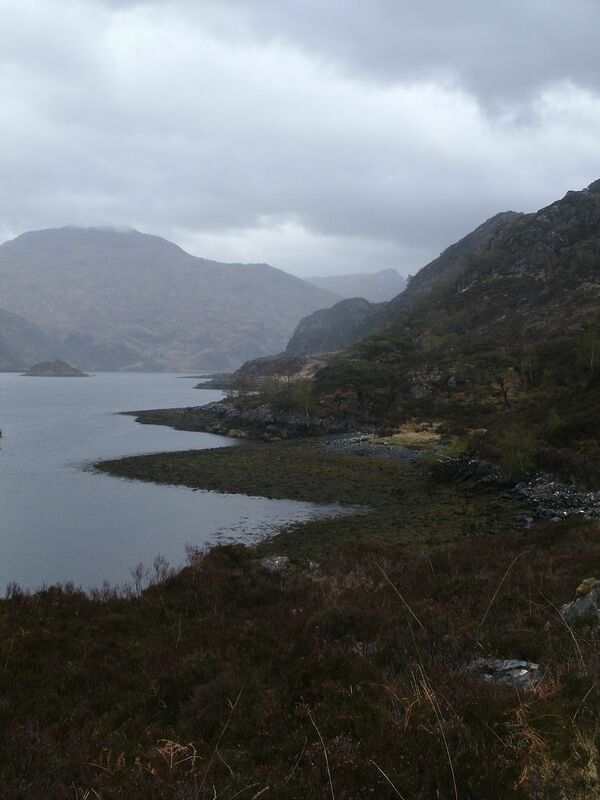 It was all quiet with no-one about, so after a brief stop, we set off for the Kinloch Hourn path, looking forward to seeing more of the scenery than we did in the clag when we walked in on Saturday. It was a fine relaxing walk back as we had plenty time Unfortunately the rain started back up not far in, and by the time we got back we were wet again.. At least the weather quashed any regrets about heading back, so maybe not a bad thing! 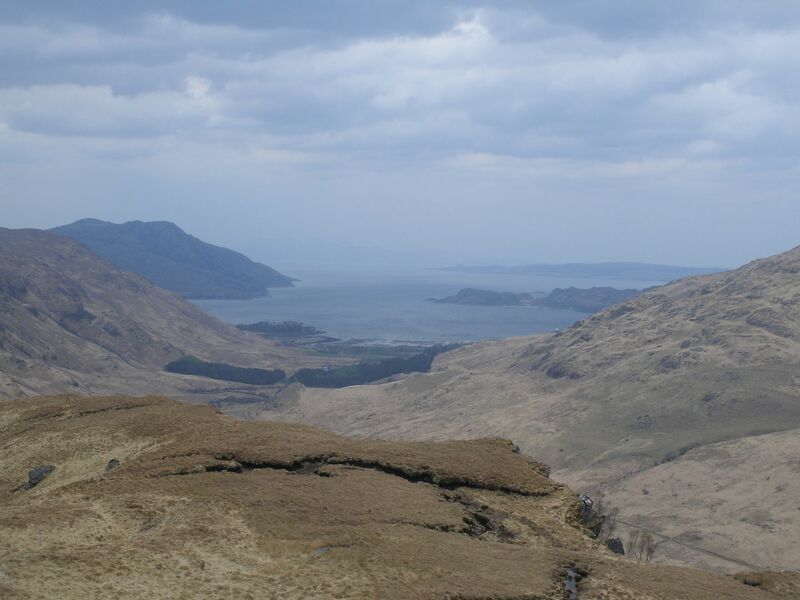 So that was the Knoydart trip – rather slow in pace, but what fun! Great report, BC - disappointing when the weather doesn't do what it is meant to. Well done for managing what you did get through in such wet and windy conditions. 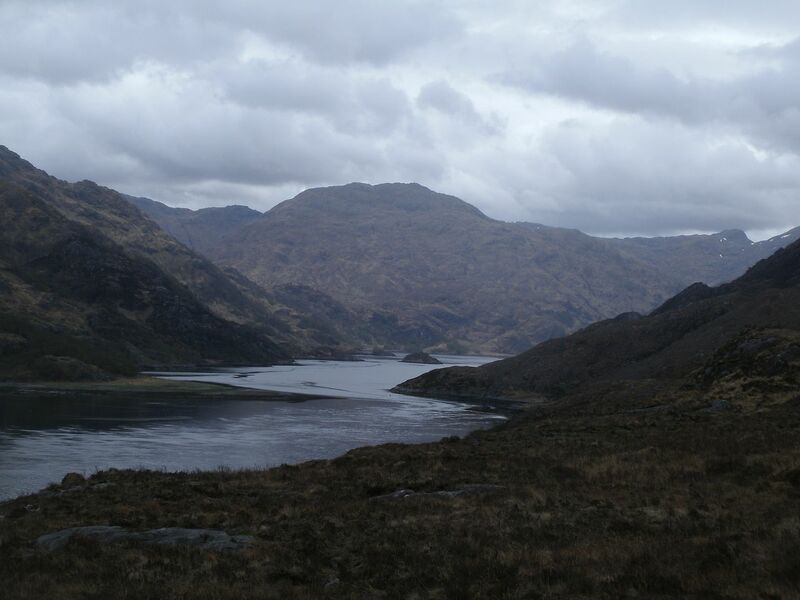 Good read, unlucky with the weather still looked braw, I love knoydart, awesome place! 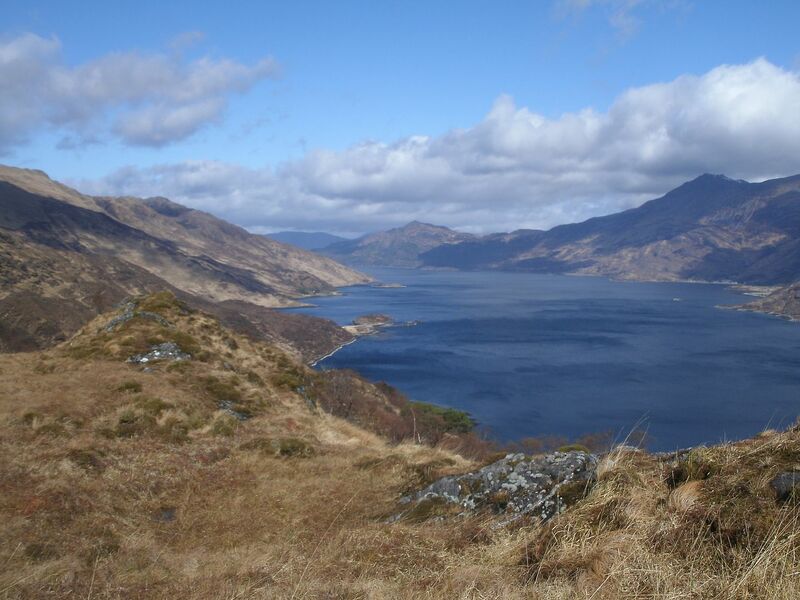 I got sunburnt in knoydart in may 2010 and am hoping to revisit this month but gonna hold out and see if weather plays ball! Never stayed in a bothy yet and your tale of the dutch man has put me off, before it was just ghosts and mice keeping me from them! Oh what an epic, so glad you managed to get some sunshine on your expedition. For goodness sake, May is supposed to be a good month for weeks in the hills. You're a hardy pair right enough. That's an epic! Love the report and well done in that weather for persisting. 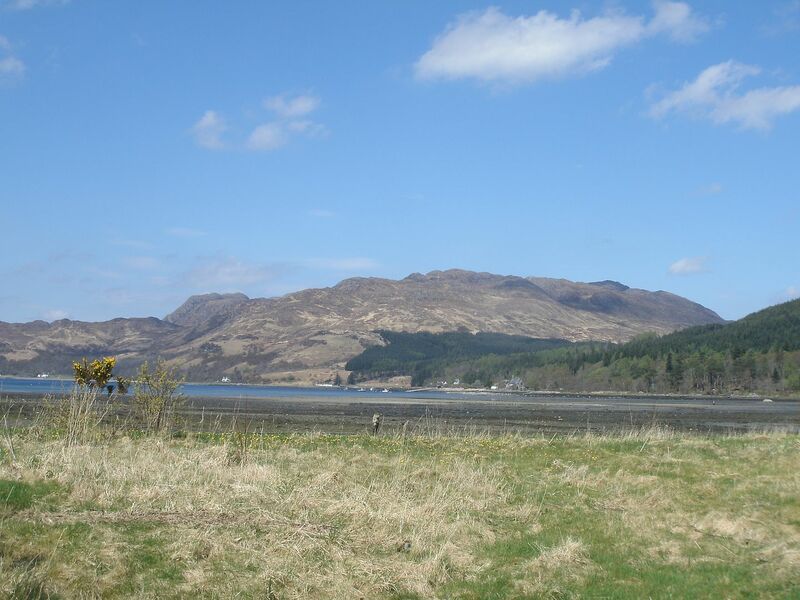 I still haven't been to Inverie yet - must change that soon. Your report illustrates well there's no gain without pain.... Were visible skid marks and ticks worth it to get those views? Well done for presevering in that weather - at least you got some sun in the mix. Oh thanks for all your kind comments.. 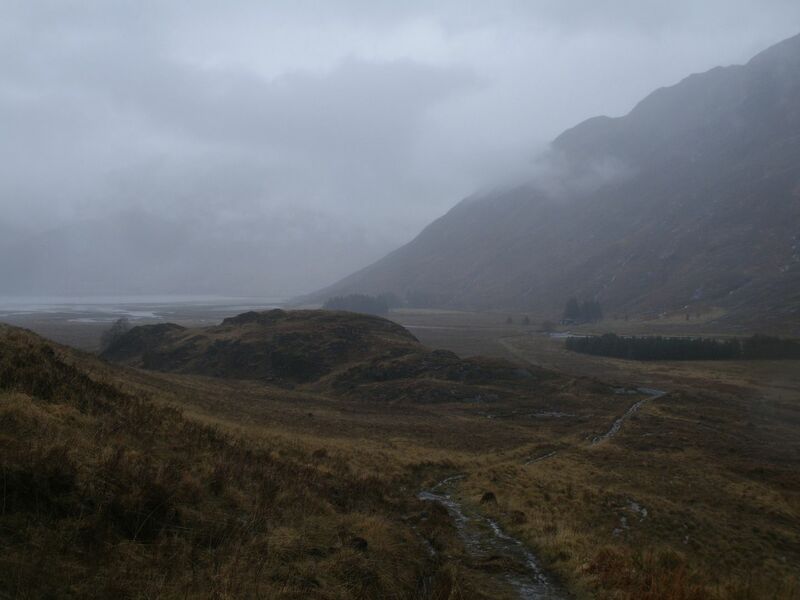 It wasn't really hard to keep going, even in foul weather it is a right bonny place..
tamw51 wrote: Never stayed in a bothy yet and your tale of the dutch man has put me off, before it was just ghosts and mice keeping me from them! basscadet wrote: I soon found out that the pitch had drawbacks, when I looked down whilst making a cup of tea to find literally an army of ticks advancing toward me over my sleeping bag, they were everywhere! och the ticks arent so bad.. at least they use anaesthetic, so you are mostly unaware of them! I am a bit too blaaze about that kind of thing.. I was always the one that had to go out to the shed for logs when I was living in Australia - It was completely infested with redbacks and my 'local' flatmates were terrified of the place, but it was always fine I found. Cockroaches though No way!